Global Travel Media » Blog Archive » JOHN ROZENTALS finds a handy guide to stuff into his battered suitcase. JOHN ROZENTALS finds a handy guide to stuff into his battered suitcase. With most serious drinkers becoming tired of clinical assessment, wine-based tourism definitely has a huge future, with books like Lonely Planet’s Wine Trails gradually replacing more academic tomes based on tasting notes. If you love travel and enjoy wine, or vice-versa, then you should have a copy of the book in the luggage. 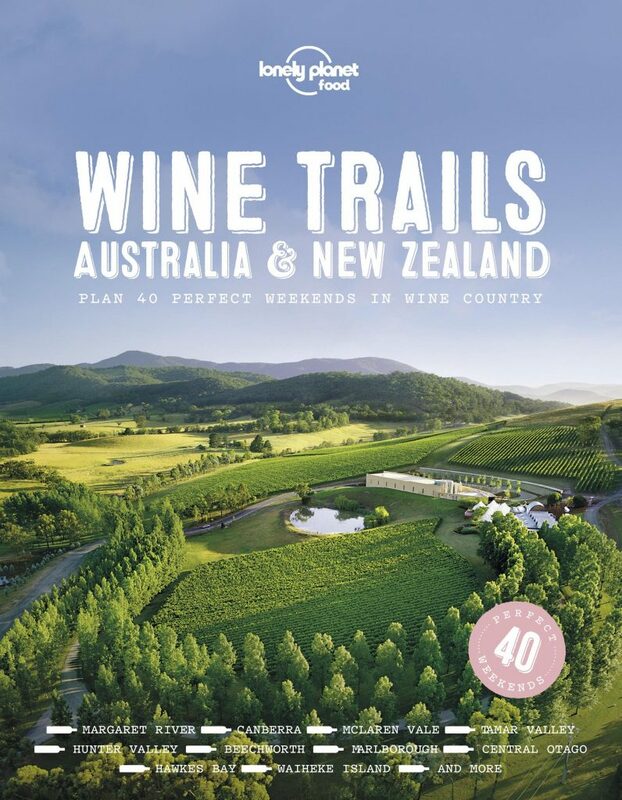 It provides a comprehensive companion to 40 weekends of wine-tasting in Australia and New Zealand, and is an invaluable guide to tasting each region’s best wines, eating at its top restaurants and meeting its most interesting people. Australian regions covered include Canberra, the Hunter Valley, Mudgee, Orange, Riverina, Queesland’s Granite Belt, the Adelaide Hills, Barossa Valley, Clare Valley, Coonawarra, Langhorne Creek, McLaren Vale, a bevy of Victorian regions such as Beechworth, the Bellarine Peninsula, Heathcote, King Valley, Macedon Ranges, Mornington Peninsula, Pyrenees, Rutherglen and the Yarra Valley, plus Western Australia’s Great Southern, Margaret River and the Swan Valley. And that’s not even starting on lands across the ocean — Tasmania and New Zealand. Coriole 2017 Montepulciano ($32): A large, dark brooding Italian if ever there was one. It’s made from one of Italy’s main red grapes, which seems to have adapted well to South Australia’s McLaren Vale. Take a bottle to your favourite Italian bistro and drink it with a bowl of red-sauced pasta. The fruity dark cherry flavours, nuances of chocolate and gentle tannins will go fantastically with the food and really make you wonder why it’s taken Australian grapegrowers so long to get excited by what has working in Italy for generations. Coriole 2018 Nero ($26): Nero d’Avola is a minor newcomer to Australian viticulture but not so to southern Italy, where it has been the principal red grape in Sicily for a couple of hundred years. The fact that it grows well and produces good wine there led Coriole’s Mark Lloyd to introduce it his Coriole at McLaren Vale, which also has a hoy, dry Mediterranean-style climate. Based on this wine, it shows real promise, having produced a dry red that isn’t huge when compared to the area’s shiraz but that is still full-bodied. A good wine reminiscent of alcohol-steeped blackberries — yum. MadFish NV Prosecco ($23): Let’s continue the theme of Apennine influences with this delightful Italian-style dry sparkling wine. It’s simple, fresh and deliciously fruity, and makes a marvellous aperitif. And don’t scoff at the stainless-steel beer-cap-type closure. I reckon that it’s the way of the future, both because of the removal of any possibility of cork taint and because of the convenience. Screwcaps are widely accepted on table wines, and crown seals will become widely accepted on sparkling wines. The bottles are even designed to take a crown seal for primary fermentation.